(Newser) – A new children's book isn't just written for kids—it's written to make them fall asleep, and fast. 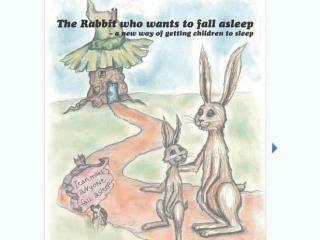 Author Carl-Johan Forssen Ehrlin, a Swedish behavioral psychologist, says he filled The Rabbit Who Wants to Fall Asleep with psychological reinforcement techniques to make young listeners doze off in minutes, the Independent reports. "These [techniques] are formed in a way to help the child relax, fall asleep faster and sleep calmer every night," Forssen Ehrlin says. "The tale gives suggestions to the child's unconscious mind to sleep." Not only does protagonist Roger The Rabbit encounter characters like Sleep Snail, Heavy-Eyed Owl, and Uncle Yawn, but parent-readers are instructed to yawn often and speak italicized words in a calm and slow manner, the Telegraph reports. Think it's bizarre? Well, it's the first self-published book to top Amazon's best-seller list. That brings back memories. We would rock them , and hum very low. They would hit the snooze button. Very slowly, I would get out of the rocker, lay sleeping baby in his crib, turn to tip toe out and...... WAH WAH WAH WAH WAH. I used to yawn, breath really heavy and even pretend to doze off. After a while the kids caught on and we had fun with it. They would smack me a little and I would just start all over. Good times.